In this episode, we are talking about the rapidly expanding field of telehealth, which is the use of electronic communication to remotely provide healthcare information services to patients who need physical therapy. Telehealth is gaining more and more attention as providers, patients and payers all seek more effective, and cost-efficient ways to deliver care. Here to speak with us about telehealth and physical therapy is Rob Vining. He has been a physical therapist for many years and has worked across all settings with the focus on outpatient orthopedics. His current mission is to bring telehealth and technology into the practice of physical therapy. He Cofounded the software company, PTLive and created the educational platform Telehealth PT. He hosts the Telehealth 20 Podcast and PT TechTalk. He is also a guest lecturer at physical therapy programs about telehealth in the physical therapy profession. As a free gift to accompany this episode, Rob is providing you with the telehealth library. This package is valued at over $120 and includes archived Q&A sessions, webinar training, featured in-depth discussions on telehealth, information on marketing, consumer engagement, technology, security, and much more. To download this free telehealth library, all you have to do is text the word 130Download to the number 44222. If you’re on your computer, you can go to the URL www.DrJoeTatta.com/130Download where you can enter your name and your email address. Take a moment to download this free gift and let’s begin with Rob. Rob, welcome to the show. It’s great to have you here. It’s great to be on. Thanks so much, Joe. I’m excited to talk to you about telehealth. I know you’re doing some incredible, awesome and groundbreaking things that are out-of-the-box, which I love. One of the reasons why I started this show was to be out of the box. Let’s help people with pain. We needed physiotherapists at the forefront of that. Tell us a little bit about yourself. When did you start practicing PT? How did you get into telehealth? I graduated back in 2004. I have my MSPT and that was back at the time where there was a big shift in trying to be evidence-based. When I got out of school, I had a lot of training in the McKinsey Framework. With that training, there were all these things going on the back of my head where I would see a patient for three or four visits and they would get all better. I never had to touch them. I did three clinicals in school that was specifically with some of the practitioners that would teach McKinsey courses. That was one of the things that influenced me as a young clinician coming out of school was to see that capability to do it without touching a patient but getting a patient better. That led right into what I’d done in the past, which was doing anything to create a system to make things more efficient in whatever I was doing. I had a musical background and had gone into developing systems with that for unsigned artists. This just fits right in my thinking about telehealth with combining that with my upcoming profession of physical therapy. I got into it around late 2004. I built a system, direct physical therapy or direct PT. As I was graduating, I created that and I worked in that for a couple of years. It was a bunch of people on boats and yachts and people offshore that were Googling, “Online physical therapy.” That was interesting to see that there was a need for it even if it was a special niche, but there were still people that wanted to stay active. They didn’t want to have to come back to shore to get an opinion from a doctor. I worked in that for about two and a half years before Google changed their algorithm. All of the traffic I was getting from the search terms online physical therapy completely tanked. I went back into focusing on the end clinic side of things. About a few years ago, I got back into it again and developed a whole software system. That brings us up to now where I’ve just been pushing it as hard as I can to get it into our profession. There are all these niches to be seen that have the capability of letting a patient benefit from it in the most convenient way. There are all these small niches like women’s health or pediatrics and even wound care that has the capability of letting a patient benefit from the most convenient way to be seen and sometimes that’s not in the clinic. If you look at those instances like the weather, this winter, the weather came into play big time. It was minus 40 degrees in the Midwest in some areas and the clinics were shutting down. There are always these certain instances that can help keep that connection and keep a patient from missing visits. At the same time, you have certain instances where these high-level professionals that want to do things like CrossFit or mixed martial arts and they’re not professionals in that, but that’s their hobby that they don’t want to stay away from. They don’t have the time to get out of their normal 9 to 5 and go to the clinic, but they still need to be treated with some professional level of care that we can provide. Physical therapists are perfect at providing that triage information because that’s what we’re doing all the time anyway when we have that initial evaluation. We’re always looking for those red flags. That leads us to be the profession with the most amount of time because a doctor is going to see somebody twelve minutes to fifteen minutes max before they get to jump into their next patient. We can dig into that triage point and try and find the issues that sometimes general practitioners might miss. I feel that we can do an excellent job of triaging patients to where they need to be and also just the normal musculoskeletal issue. Some of those general practitioners see a patient and they are handcuffed because they can’t give out opiates. They aren’t trained in how to treat pain a lot of the time. It puts our profession in that perfect spot to perform that initial triage and I think telehealth plays right into helping it elevate our profession. I also think of the number of people with physical challenges who are in their home who can’t get out or a little bit scared to get out. They’re scared to leave their home. It’s a good way for them to start a conversation with someone rather than, “I’ve got to go to this clinic or I have to go to the hospital and leave my home and arrange that. Let’s get a friend or family member to help me or get a disability van to bring me there.” Those are all major barriers for people. That’s one thing that I was constantly seeing. When I was dabbling a little bit in home health and doing the side hustle of home health at the same time that I was working on these software endeavors, I would always hear from my patients, “You didn’t have to come out here to do this,” especially with knee replacements or hip replacements. They would say, “We could have just done this online.” I’m like, “It’s funny you say that.” It was great to have these conversations with patients that could give me that insight. Even ones that are 60, 70 and even 80 years old, they’re comfortable with using technology. A vast majority or even on Facebook right now, which would blow people’s minds a few years ago but it’s true. Technology has been integrated into everyone’s lives right now. As a profession, we can seriously capitalize on this moment and make our profession one where people see us as not only the unknown profession that I feel like we still are. We can be the profession of choice for that triage. That’s why I’m pushing this so hard right now because I think it’s available. I live in New York City. I’m walking around the street to see people with no cell phones then everyone had cell phones. Everyone was walking around with little earbuds. Now, I see people walking down the street on video talking to their friends. The technology has past arrived. It was here years ago and now it’s like, “How do we start to put it in play and get it in place?” PTs want to know, and our profession is sometimes overly altruistic unfortunately, is it “legal?” “Is someone going to come into my home and arrest me because I’m doing this?” PTs are so altruistic sometimes. There’s no PT Police Department roaming around. Talk to us a little bit about some of those types of topics initiatives for physical therapists. One of the biggest things that were a barrier as soon as you would say telehealth, it would immediately jump to HIPAA. Everybody was worried so much about HIPAA violation, which you should be because you want to keep your patient’s information safe. You don’t want to break any rules or regulations. At the same time, a lot of people were going into it with a blinding idea of what HIPAA is. The scenario of a non-covered entity versus a covered entity. They’re completely separate. It almost took me backtracking and hitting the rewind button to educate people first and foremost on getting over the fear barrier and explaining the HIPAA monster, as I called it. When you walk into a room of 100 PTs and you say the word HIPAA, 96 of them duck under a table immediately. That’s because we called it the HIPAA Law. It’s as if the FBI was going to come in and handcuff you and take you away. Once that educational piece was provided and people would let their guard down, middle of last summer to now, I’ve seen a massive ramp up in interest in our profession specifically referencing telehealth. Everybody wants to know something about it, especially at CSM. There were some pictures taken of a big telehealth presentation and it was overflown. When you’re overflowing a room for presentation at CSM, that’s a huge sign. A few years ago, it was tough to fill that room and now it’s overflowing because people see that as a possibility and an avenue of treatment and care and helping patients even more. As physical therapists and as practitioners, are we behind in the telehealth revolution? We need to utilize technology in a way that brings that relationship out between the provider and the patient. We are. Even if you look at speech therapists and occupational therapists, they’ve been using telehealth for a bit longer than we have. If you look at the telemedicine space, doctors have been using that for a little bit sometimes unsuccessfully because you have to have time, first and foremost. You have to have time in order to be able to utilize technology in a proper way. If it’s going to be the same, “Hi, how are you? Here’s your imaging. Here’s the test we need to run. See you later,” and then you duck out. It’s not providing that much more quality care. It’s providing that small aspect of convenience. We need to utilize technology in a way that brings that relationship out between the provider and the patient. That’s why I keep harping on time. We have that as physical therapists. We can utilize that much better than the normal general practitioner that won’t have more than twelve minutes to see you because they’ve got a whole room of people waiting for them. I’m all for putting PTs front and center as far as neuromusculoskeletal care is concerned. I’m going to start saying this more and more, in that primary care position for neuromusculoskeletal care really should be not only PTs but PTs really should be there. Chiropractors have similar skillsets that we have, but I’m a PT so I’m going to go to PT. With telehealth, does that mean that this is covered by insurance or is it a cash-based model or are there hybrids? Talk to us about that. There are a few different ways with this. The most common right now is the cash pay model. It makes it a little bit easier. It cuts down cancellations because you have patients paying before they get to their visit, which is a huge plus. We hang that carrot out in front of them so they don’t cancel. There are parity states. There are 30-ish states that have what’s called Parity Laws where insurance must pay an equivalent to what they would pay if the patient was right in front of you. Sarah Gallagher who did one of those CSM presentations, she’s out in Colorado and runs her clinic through that parity model. It’s been successful. She’s treating concussions and vestibular issues and it can let her clinic expand their reach not only to that central Denver area but outside all through Colorado. There’s that combination that is applicable where you can run a hybrid model of having a brick and mortar clinic and a telehealth component to your business and you’re running it through insurance. It’s a little tricky at times because you have to make sure that the insurance is going to pay. They might have some extra hoops or hurdles that you have to jump over to get that reimbursement. I’ve seen a combination of even cash pay clinics and mobile therapists that will provide services in a patient’s home for cash. They’re also adding that telehealth component as well so that on bad weather days, they still don’t have to miss a visit. They can connect with their patient to treat them. It’s all over the place right now. It’s like the Wild West right now. I think about the weather that we’ve had in certain parts of the country. When the weather is bad, PT patients cancel appointments very rapidly, at least they do in New York. Maybe in Minnesota that used to have a lot of snow and cold. In a city like New York where there are seasons that change, obviously there are four seasons. When it snows, it’s cold. A lot of elderly people don’t want to come out. They still want connection though. The one thing about telehealth to me that’s so interesting is that people just want that person to talk to. They want a connection. They want knowledge. It’s almost like a Q&A. They have someone there. If there’s a question, I know I can rely on that person. It’s important. If insurance authorizes telehealth, do you still have to go through the typical authorization and paperwork if that’s the case? If they’re paying through parity, then it’s just the exact same. You’ll do your number of units. You submit all the paperwork just like it would be an in-clinic version or in a clinic visit. The biggest thing is that first time for each individual insurance. I’ve heard it’s the best way to do it is to sit on the phone and start writing notes for that one insurance. More often than not, you can rubber stamp that process every time you have a future telehealth visit with that specific insurance company. You know all the hoops and all the hurdles to jump over. You’re going to have to do that bad part with almost every single individual insurance. Some of them will have different ways and means of going about reimbursement. If you miss a couple of hurdles, then they say, “Sorry, it’s not our fault.” You don’t want to run your business on something that’s not going to reimburse you. That’s the important part. They’re looking for the service, but trying to figure out, “What is telehealth? Where does it exist? How do I access it?” Tell us about some of the things that you’ve been working on to fill that void? We’ve got a system. I and my cofounders made PTLive years ago. That was simply what I like to call it as a text and telehealth and scheduling platform. It would sit on your website like a regular old live chat. Everyone is similar to that little bubble in the bottom right-hand corner of the screen that usually has a live chat. What we did that differentiated our service from others is we had the capability for clinics to allow their physical therapist to staff that live chat and answer to questions through regular text messaging. They have to sign a business associate’s agreement on that stuff so they’re HIPAA compliant. Now, we’ve got almost 400 physical therapists. If all of your patients can’t answer the chat, you can set our system up to where it goes out to any physical therapist that is available to answer those high-level questions for patients. Patients a lot of the times, if they are new to PT, don’t know what we do. The capability to talk to a professional that can answer those high-level questions to make sure they’re a good fit for that clinic. They click a button and it pulls in the schedule for the week right inside the chat. It helps to convert the traffic that a lot of people are into digital marketing to get traffic to their website. The big problem was that I foresaw in advance is if you don’t convert that traffic, it’s useless. You have to have some way to convert the traffic. Just like we have a phone in our clinic, you need something on your website to help answer those questions. That’s not just the front office person that sometimes can’t answer everything. If you have a professional that can answer those questions and get them scheduled, take some load off your front office, converts patients, makes your marketing more efficient and it costs less money overall to get a new patient. We went into that a few years ago. It’s grown pretty steadily to this point so it’s been fun. From that, you’re evolving other types of systems and platforms? 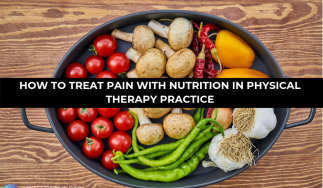 It will be a game changer when physical therapists can act like specialists because they have such a wide wealth of knowledge on so many different topics that they can start to solve the problem almost immediately. I was getting bombarded with questions about telehealth, “Can I have an hour your time?” That was the most common thing popping up on text messages and through Messenger. At some point, you just have to go, “I can’t.” I started a podcast called the Telehealth 20 podcasts and that dealt with telehealth and physical therapy. At that same time, I knew I needed to make some repository of information. We developed TelehealthPT.com, which we give away enough information for 80% to 85% of therapists to get started using telehealth in whatever setting or practice they’re in by having the knowledge and information available for free in a centralized area. Now, we’ve gone a step beyond that. We’ve decided to make a central patient hub that acts as triage for patients from anywhere to help answer those questions and then get them matched with the physical therapy clinic. If they want an in-person visit, the software already does it for the patient and the therapist that’s talking with them. We try and erase all those hurdles and barriers and blockades and let a patient talk to a physical therapist. We let them figure out if they’re a good fit for their issue to see a physical therapist to get it solved. There’s a step that the patient can take to schedule right then or they can click a button and start seeing a physical therapist for a live one-on-one telehealth session right then. There’s a whole payment platform set up inside that one little chat. We’re trying to make it as possible to put at the forefront for anybody that needs help. Because of all the marketing efforts that we’ve done in the past, it still hasn’t made it easier for the population to know what we do. I figured like, “Throwing all my cards out on the table face up. This is what we do. There are no barriers to entry. Come talk to a PT for free. If you’re a good fit, this is what we suggest doing next or just go to a clinic or see somebody for telehealth and then we can get those patients in the door,” without them having to go and see their general practitioner. Sit in the lobby for 1.5 hours and maybe get a cold or a cough or flu from somebody else’s sitting in the office. Get their issue especially pain and musculoskeletal issues resolved as fast as possible through a PT doing the triage. As physical therapists, we can act specialists and that will be the game changer. We have such a wide wealth of knowledge on so many different topics that we can act as that specialist and then start to solve that problem almost immediately. It doesn’t even come down to if they want to go somewhere or not, I think it’s just access to a real specialist right now. I truly believe that word of mouth will spread fastest by some system like this with no barriers, no payment upfront needed and being able to converse with a high-level professional that can triage. Once that triage is properly performed, it’s a no-brainer. People are going to talk about this a lot more than, “The general practitioner that I go to is the best ever.” Everybody says that but did they solve your problem? That’s the big thing. It also puts the physical therapist in a position of being an educator instead of a clinician. You’re always a clinician, but it puts you in place to coach and educate people. It’s where I think most of our healthcare needs to go especially with chronic disease and chronic pain being part of that. Do you think that PTs are willing and able to step into that position as an educator? Is there a certain condition that you think people with pain or people with health conditions will find more useful when it comes to telehealth versus others or maybe a certain segment of healthcare? I think the musculoskeletal population because that’s been the biggest hole. Nobody can figure that out. That’s costing companies the most amount of money for injured workers. Everybody is trying to figure out where they can fit into that self-insured company’s plan of care to where they can get in at the fastest moment where the potential employee needs help and somebody shows up right there. That is the number one thing because it’s so prevalent and not completely solved yet. There are many little niches. There’s women’s health that has exploded in the PT space. I didn’t know all of the things that women’s health physical therapist could do. The more that I find out, the more that I talked to one of the guests that I have on the show pretty often, Juan Michelle Martin who is a women’s health physical therapist that is also a mobile physical therapist. She uses telehealth in her setting as well. It was eye-opening to hear that it helps the embarrassment part. That’s one example where telehealth helps solve an issue that wasn’t a patient-provider issue. It was more of a patient embarrassment issue. When they can do it in their own home and get things solved, it links up the need for the solution. I’m happy about that. If you’re a licensed physical therapist trying to help somebody, at least you’re providing some information that’s useful from a professional perspective. I never even thought about that. That’s a good case study. Are there any other kind of case studies you can share with us? People that get knee replacements that don’t have family members because their family members might be all working and their kids are going to school. They can’t drive to get to an outpatient setting. You’ve got this little gap where it’s after home health but before outpatient. It might only be two or three weeks. During that time, you can have a whole bunch of regression and you can have a whole bunch of doing things that flares the knees up. You’ve got a patient that is active. They finish home health and in their mind they’re like, “I’m good to go.” They go out for two or three hours and the knees swell up like a watermelon. They’re sitting there for two or three weeks wondering, “What did I do?” They have no interaction with a professional. Maybe it makes them do much less and they get to outpatient and now their range, they’ve lost fifteen degrees. That could have been stopped by having an in-between to fill that gap like I think we could use. Hip replacements are easy. With hip replacements, two to three weeks in especially if they’re active, they’re like, “I’m good to go. This was the easiest thing ever.” Those knee replacements with that swelling especially if they’re a first knee replacement. They’re questioning, “Am I doing something wrong? Should I do this?” Some of them take it into their own hands in the wrong way. That’s where telehealth could step in there as well. As you’re talking, I’m wondering if there’s a place for small business or corporations that might find this a useful tool with a worker or an employee is injured or has some type of pain syndrome that flares when they’re on the job instead of worker’s comp, fill out the form and get sent to the doctor. The doctor does an extra an MRI. There are so many different channels and so much wasted money. If they could access something like this first, which would bypass all that and save millions and millions of dollars. I believe that it will. This has been a long road for me. This is 2005 to now. Now is the first time that I’ve seen a massive push towards telehealth being a popular term in this space, in our profession. I am chomping at the bit. At the same time, I’m trying to reflect on back when I first started doing it. I can come from that mindset versus being fifteen years into doing this and saying, “We’ve got all this other stuff.” I get the deer in the headlights look from PTs sometimes. I’m like, “Pull back a little bit.” I think it can help those certain circumstances where somebody needs care right now. 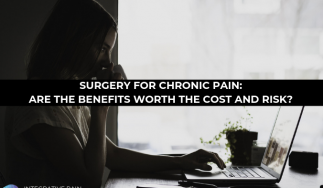 It can cut that whole process of going to get an MRI, going to the general practitioner, getting a shot, getting an X-ray and that whole thing. You’ll have $2,300 to $2,400 saved if you just see a PT first for low back pain. That in and of itself should be shouted about, but I think it’s been almost overshadowed by the opioid epidemic that is beyond the front and center right now. There’s a colleague of mine, Karen Finnin, that’s over in Australia. She’s been leading the way in and leading the charge on her side of the pond. She and I talk all the time about this. It’s mainly trying to figure out how to push this to our profession without them feeling that we’re telling them that they can’t use their hands anymore. In every country, it seems as if there’s a small nucleus of physical therapists that know what’s useful and are not discounting the use of our hands and touch. At the same time, it’s trying to get over those barriers. No one has solved the issue of using telehealth in the physical therapy or physiotherapy profession, but it’s becoming more prevalent. The World Confederation for Physical Therapy is going to be putting out a white paper on telehealth itself. There are specifically a few folks in the states that I’ve spoken to. There are a few folks in Australia and a collection of different first world nations that are trying to put together some guidelines. The thing that I’m hoping is that they try not to put in any language that limits where we can treat because patients want to get better. If there was something in that language that said, “If you’re doing some free triage, you can see anybody anywhere.” What’s the harm in that if you’re a licensed physical therapist trying to help somebody, at least you’re providing some information that’s useful from a professional perspective? That should be something to get into that language to allow our whole profession worldwide to be on the same page and to be there for patients that need it. That would be nice, “Being on the same page worldwide,” it sounds awesome. Rob, I’d love to learn more about your platform. I hope everyone checks it out. It is the wave of the future. The number of people that read my blog and say, “I learned so much about my pain from it. I was able to take action and get better and either find a PT. Start exercise and different diets, meditation, find a psychologist that I could work with,” and all that has happened from this blog. Telehealth is going to 10X that. Please tell everyone how they can learn more about you and all the great resources that you’re working on. If you’re reading right now, we should have at least the initial phases of digital physio coming up. Here’s the big thing. It’s www.Digital.Physio. You can learn more about it there. We’ve got a big group on Facebook. There are about 1,800 providers now, physical therapists and physiotherapists worldwide. That’s on the Facebook group. If you type in Telehealth Physical Therapy, it will pop right up. There’s a lot of us there trying to help each other. There’s no ego in that group at all. One thing that we focused on is helping each other. I know how you did that. You don’t have to be doing that. It’s quite nice to see. I try and squash any of that with some personal private messages. It’s a lot of admin work. Since that flywheel is going, it’s just a whole bunch of people that are constantly trying to help. You hear crickets when somebody starts to throw a fit about something because nobody is going to interact with that and waste time. That’s a good group to hop into. If you’re just looking for basic information on how to get started, go to TelehealthPT.com. We’ve got a lot of free information there as well. Everybody can go to the website and they can check it out. I want to thank Rob for being on the show. Telehealth is definitely the way of the future. Keep abreast of all the things he has going on. If you’re a practitioner or someone who has pain, make sure to share this out with your friends and family on social. Take this show and throw it into a Facebook group. A lot of us communicate in Facebook groups and need this information desperately. Rob has got a great Facebook group, but pop this into other Facebook groups so people can learn about it. I want to thank all of you for being on the show. If you’re new, make sure to hop on over to DrJoeTatta.com/Podcasts. On the upper right-hand corner, there’s a little box where you can enter your name and email address. I’ll put you on the mailing list and you’ll receive a new podcast in your inbox each and every week for free. You’ll be up-to-date on everything that’s going on. I want to thank all of you for being here. We’ll see you next time. Rob Vining has been a Physical Therapist for more than 15 years and has worked across all settings with a focus on outpatient orthopedics. His lifelong goal is to bring Telehealth and technology into the practice of Physical Therapy. 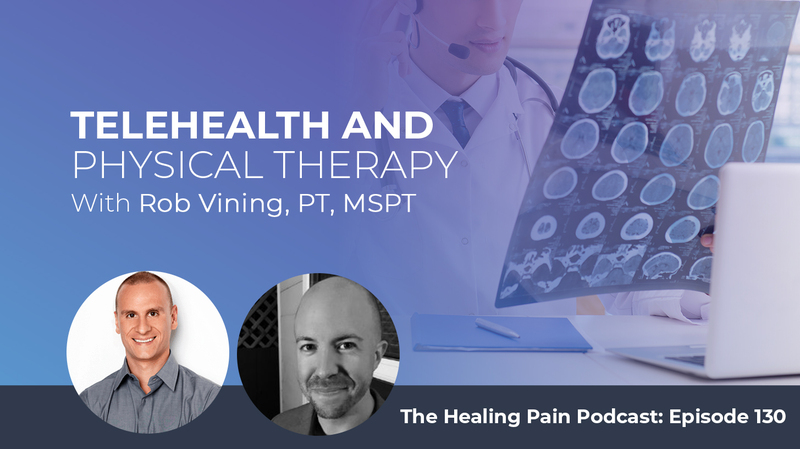 Rob co-founded the software company PTlive, created the educational platform TelehealthPT.com, hosts the Telehealth 20 Podcast and PT TechTalk and has guest lectured at DPT programs about technology and Telehealth in the Physical Therapy profession. And, if he wasn’t busy enough, Rob’s most ambitious project for the PT profession is set for public release later this month, which we will discuss as we get into the interview. 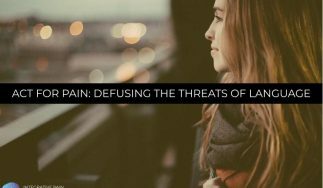 The Healing Pain Podcast brings together top minds from the world of pain science and related fields to discuss the latest findings and share effective solutions for persistent pain. If you would like to appear as an expert speaker in an episode of The Healing Pain Podcast contact support@integrativepainscienceinstitute.com.